Thanksgiving weekend was a wonderful break. I had a chance to visit with family and see a couple movies and eat out with my kids. Then came the business: for me, cyber Monday meant a dentist appointment. It was all part of the preparation for the Appalachian Trail hike, I had three teeth pulled because they could be potential problems over the next year. I'm headed toward getting dentures anyway, my teeth are so ground-down and ugly--so much so that I considered adopting trail names like 'no teeth' or 'the smile from hell'. Being the pain-defying trooper that I am, I went straight from the oral surgeon's office to a local trailhead and headed out for six miles of hiking and six miles of biking (the return leg). I carried my new toy with me: My Garmin Oregon 550t GPS with imbedded camera. The photo above was taken with it. By taking a photo with this camera, a waypoint is automatically recorded, and the photo can be directly downloaded to Google's Panoramio web site with all the mapping information necessary for Google Earth. The trail I hiked is called the Patuxent Branch Trail. It roughly follows an old railroad grade along the Middle Patuxent River from Lake Elkhorn in the Owen Brown village of Columbia, MD, to the historic Savage Mill, with its boutiques and shops, in Savage-Guilford, MD. The photo is the iconic one for this trail. It is the Pratt Truss Bridge, built in 1902 and now converted to a rail-trail bridge. 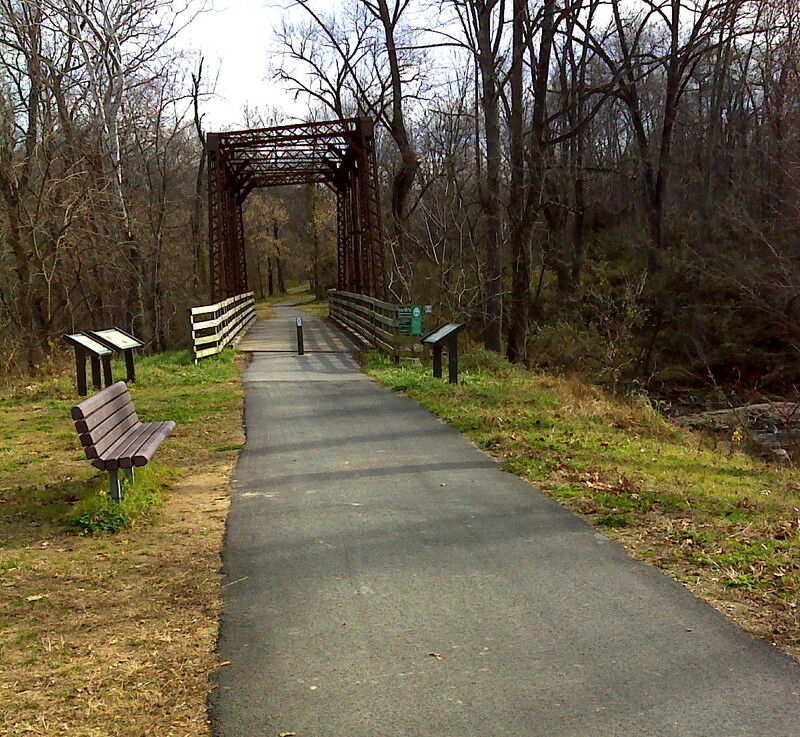 The trail is a lovely walk, all paved except for a 1.5 mile gravel section just south of the pictured bridge, and open to bicycles and pedestrians. At the south end of the trail, just a few blocks from Savage Mill, is an apartment complex where I lived from the Fall of 1980 to the Spring of 1981: my first residence after leaving my Post-Doc job at Colorado State University and starting my career at Goddard Space Flight Center. So with today's walk, I extended my Personal Continuous Footpath to another one of my former addresses. What is a 'Personal Continuous Footpath'? Imagine a set of footprints that can be followed without interruption from Point A to Point B. That's all it is: a continuous trail that I've followed using no means other than my feet. When I quit the trail for the day and get in my car to go home, I come back to the same spot the next day and resume the walk. Extending my Personal Continuous Footpath (PCF) has become an ongoing project for me, and the Appalachian Trail is just part of that project. 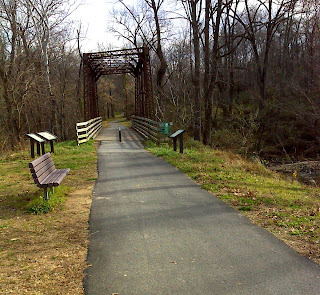 To date, my PCF runs from Savage, MD, up through Ellicott City, MD and on north for 25 miles or so on trails through the extensive trail system of the Patapsco Valley State Park to an 81 mile circuit hike around Liberty Reservoir west of Baltimore. From there my PCF extends eastward 100 miles to my childhood homes in Wilmington, DE and adjacent southeast PA, and westward 50 miles via country roads and the Catoctin Trail to the Appalachian Trail at Raven Rock Hollow. From there I've hiked the AT north to Caledonia State Park in southern PA and south to Troutville, VA - about 350 AT trail miles. The weather for today's walk was delightful for this late in the year. It was shirtsleeve weather. But there's a front on the way and the mild spell we've been enjoying for weeks now looks to be coming to an end. The harsh realities of winter look set to finally arrive. Still, I have plans to continue with my PCF project as training and preparation for my 2012 AT double thru-hike. One of the top priorities will be to do the 300 mile trek from the AT at Black Horse Gap, VA to my Topsail Island beach home--about 300 miles of mostly road walking, though the central portion of it will follow North Carolina's premier trail--the nearly 1000 mile long Mountains-to-Sea Trail. More about that as I begin to walk it.